‘Der tapfere Soldat’ (El Soldado de Chocolate – Tiralala !) by Oscar Straus, published by Casa Dotesio (sd, Madrid). 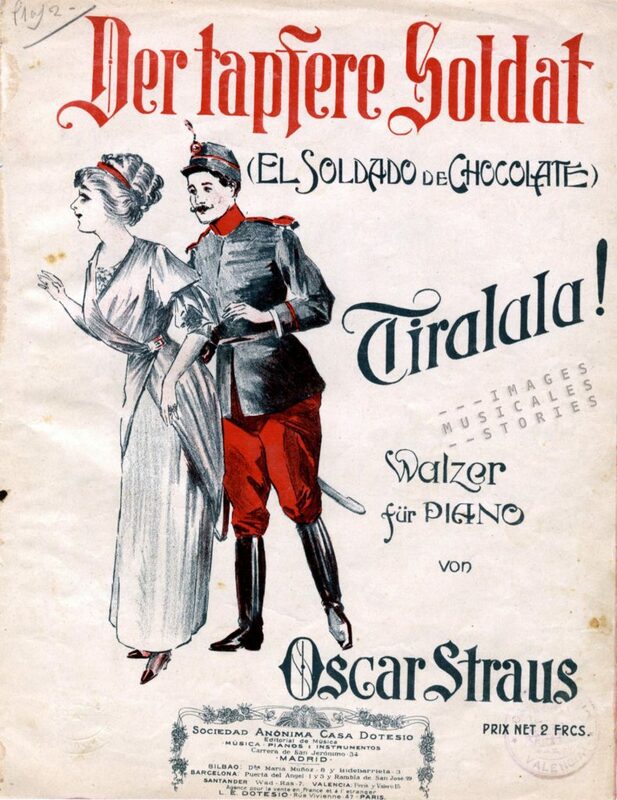 Der tapfere Soldat is an operetta composed in 1908 by Oscar Straus. It was an adaptation or parody of George Bernard Shaw’s 1894 play Arms and the Man. In this anti-war comedy the hero, a soldier who mocks war, uses his ammunition pouches to carry chocolates rather than cartridges. Therefore, the heroine of the play calls him her chocolate-cream soldier. This has inspired the pejorative use of the term ‘chocolate soldier’ for someone in the military who does not (want to) fight. 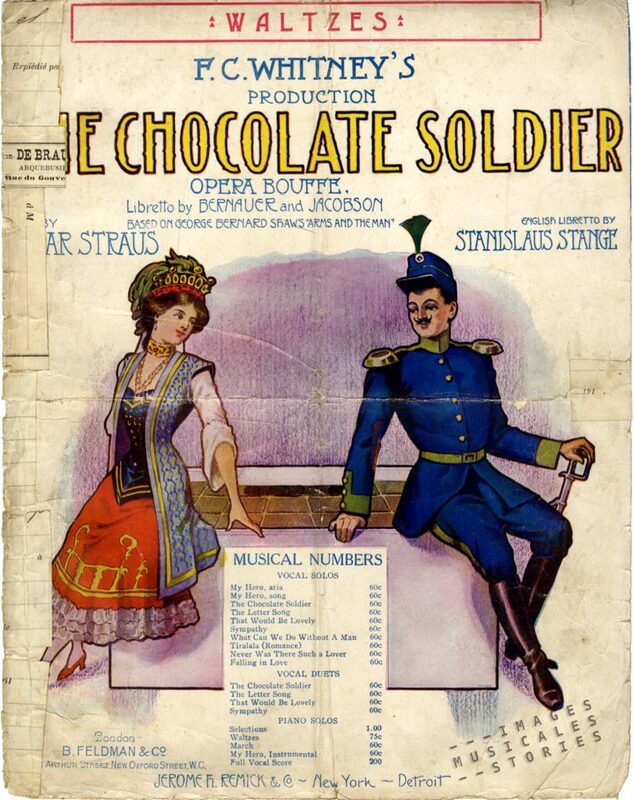 The English version of the operetta, The Chocolate Soldier, went on to international success on Broadway and in London. ‘The Chocolate Soldier’ by Oscar Straus & Stanislaus Stange, published by Feldman & Co (London, sd). The operetta was adapted for film in 1915 and in 1941. For the 1941 movie only the score by Oscar Straus was kept. The screenplay was based on another comedy because Bernard Shaw did not want to sell the rights, having disapproved of the first version of the operetta which he called “a putrid opéra bouffe in the worst taste of 1860″. You can hear a medley from Straus’ songs in the fragment hereunder. 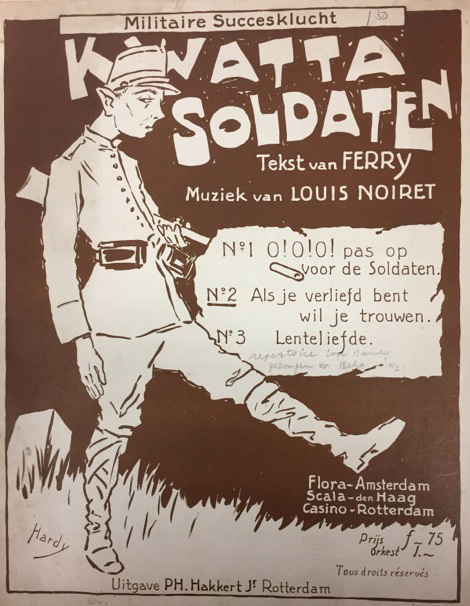 The cover for Kwatta soldaten suggests that the Dutch had their own term for chocolate soldiers. 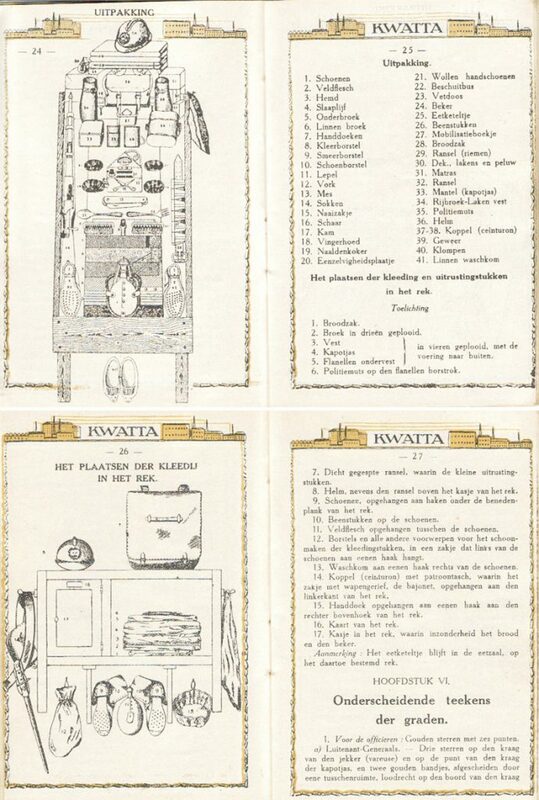 In the Netherlands, the first packaged chocolate bar was launched in 1891 under the brand name Kwatta. This bar was so popular among the soldiers that the army became its largest buyer. The Netherlands had declared themselves neutral during World War I. Nevertheless the Dutch army mobilised its troops. Of course, the men under arms kept in their kitbag the oh-so nutritious and long-lasting Kwatta bars. From then on the bars were also called Manoeuvre Chocolaad. The pink wrapper of the chocolate bar carried the pictures of a soldier and a sailor encouraging to collect the coupons which could be traded for a tin soldier or some other premium, like tableware. The bars were for sale in these beautiful carton boxes. 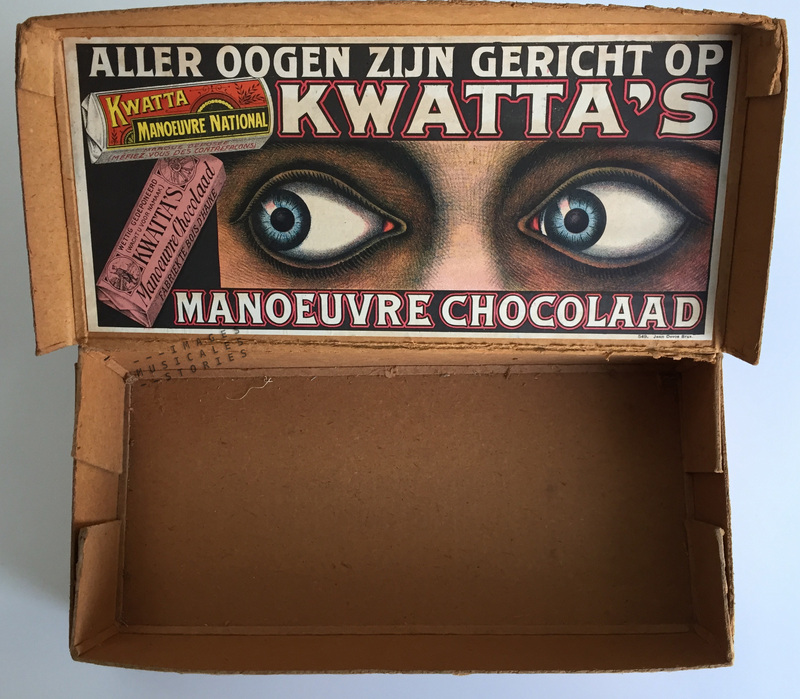 Carton box for Kwatta chocolate bars. Illustrator unknown. 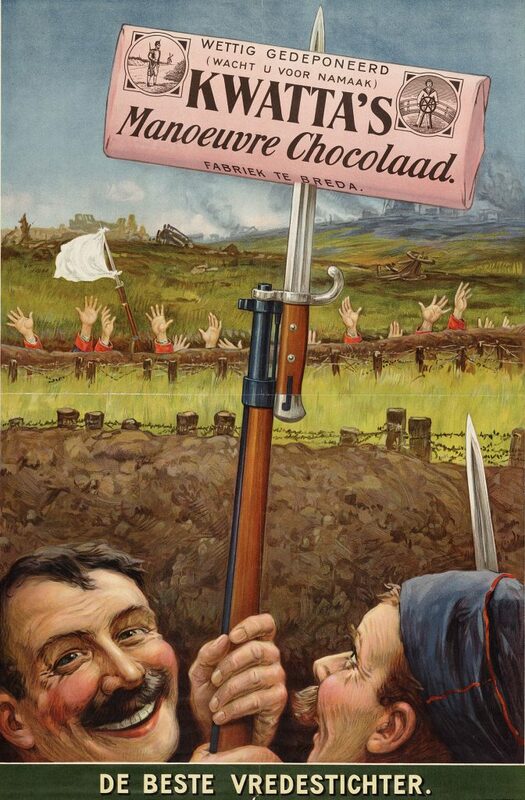 The Kwatta bars were not only popular with Dutch soldiers. Also Belgian soldiers must have loved the candy, as evidenced by this Belgian military booklet from the twenties, sponsored by Kwatta. In the fifties Godfried Bomans would himself write a book commissioned by Kwatta. The illustrations with funny moving eyes were made by his friend Harry Prenen. 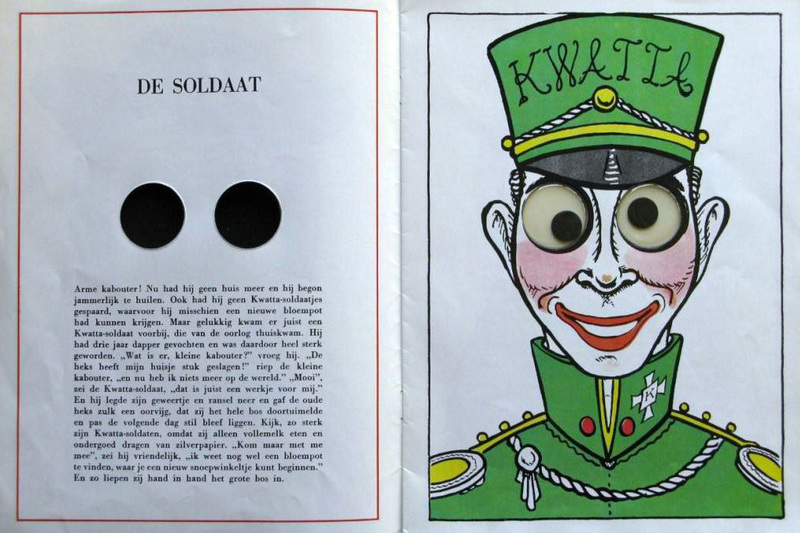 ‘Het ogenboek’ by Godfried Bomans, illustrations by Harry Prenen, published by Kwatta (Breda, 1951). We end this post with a few politically incorrect covers. 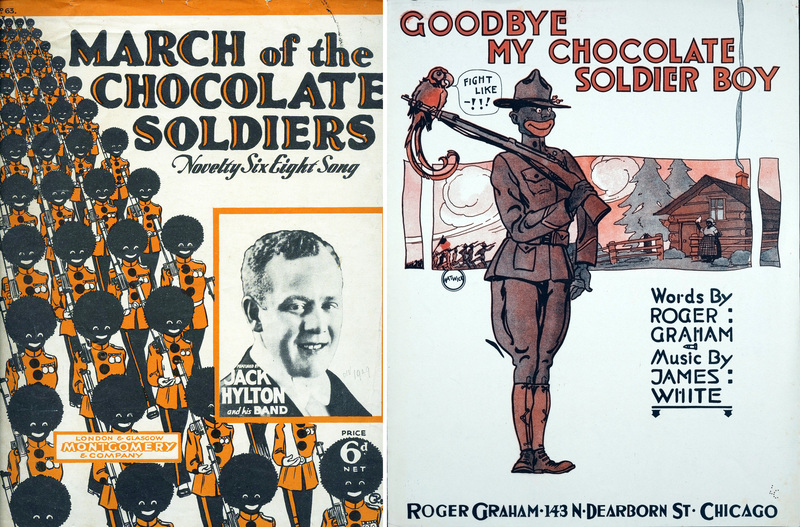 They illustrate that the term chocolate soldiers was also regularly used to refer to the soldier’s colour of skin. 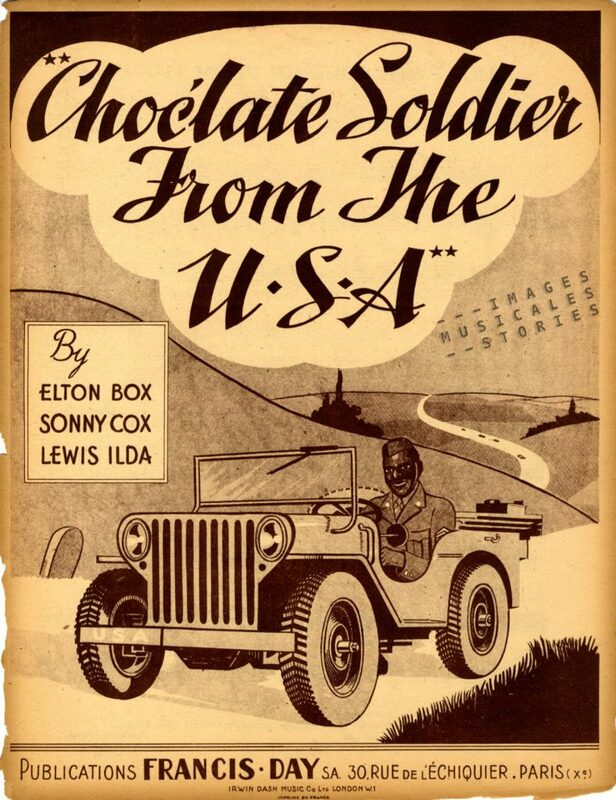 ‘Choc’late Soldier from the USA’ by Elton Box, Sonny Cox & Lewis Ilda, published by Francis-Day (Paris, 1945). 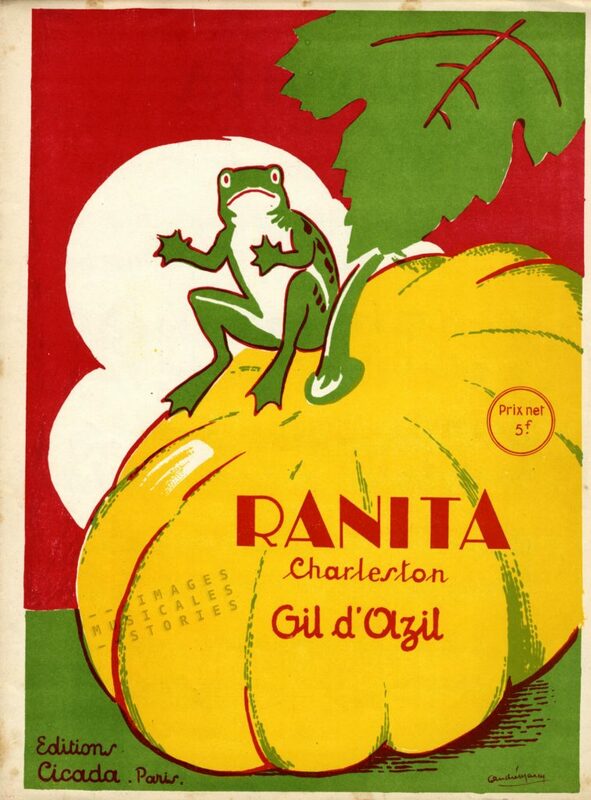 ‘Ranita’ by Gil d’Azil, published by Cicada (Paris, 1927) and illustrated by André Marcy. “Eat a live frog every morning, and nothing worse will happen to you the rest of the day”. The Frenchman Mac Norton took this advice from Mark Twain quite literally. 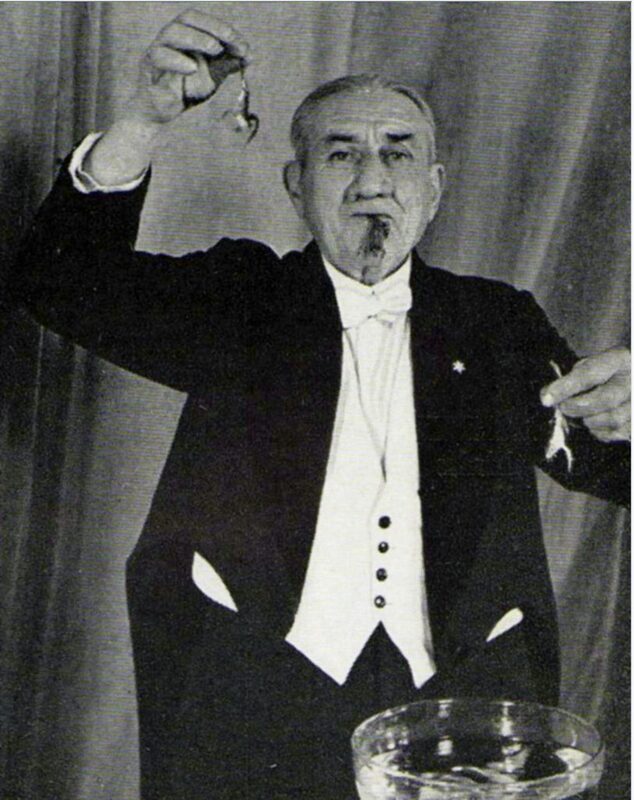 About a hundred years ago he started his magician career by eating live frogs on stage. 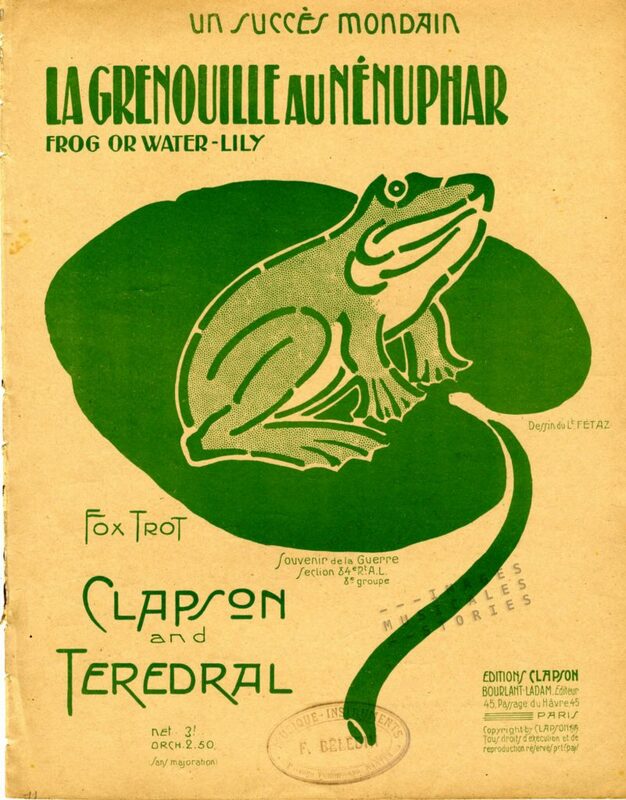 No wonder that our cute frog on the sheet music cover seems a bit worried. 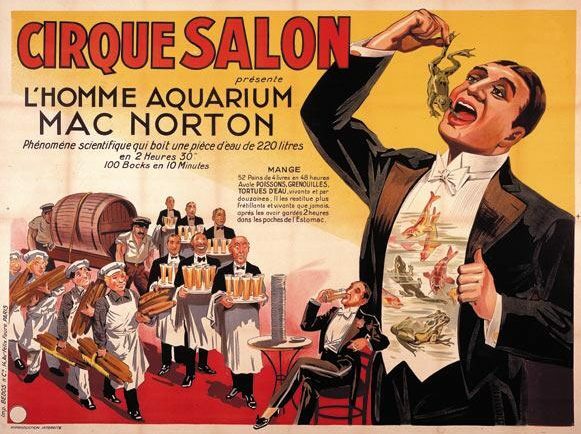 For his ‘human aquarium’ performance Mac Norton, artist name of Claude Delair, took from a fishbowl five frogs and six goldfish, and swallowed them alive one by one. Then he made a point of nonchalantly lighting a cigarette. After a relaxing moment of small talk with his audience he started to disgorge all the small animals, still alive. It is said that he could keep fish, frogs or other aquatic animals moving around in his stomach for more than two hours. All Mac Norton’s shows centered around his stunning ability to hold large quantities of water in his stomach and to disgorge it afterwards. Sometimes he would emphasise the enormous amount of water by ordering a parade of waiters to bring him 50 glasses of it. He would then demonstrate La Fontaine: he expelled the water he had just swallowed into a delicate jet in which he washed his hands. Or he performed La douche. The water then gushed from his mouth with force, but still seemingly without effort. 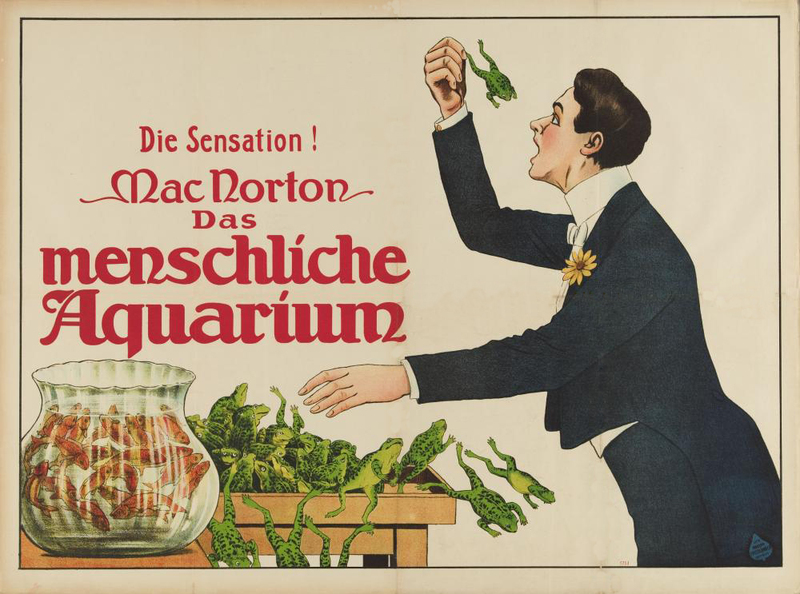 In Berlin, Mac Norton did his trick with beer. Houdini who watched the show behind the scenes was not that impressed. “The filled glasses were displayed on shelves at the back of the stage, and had handles so that he could bring forward two or three in each hand. 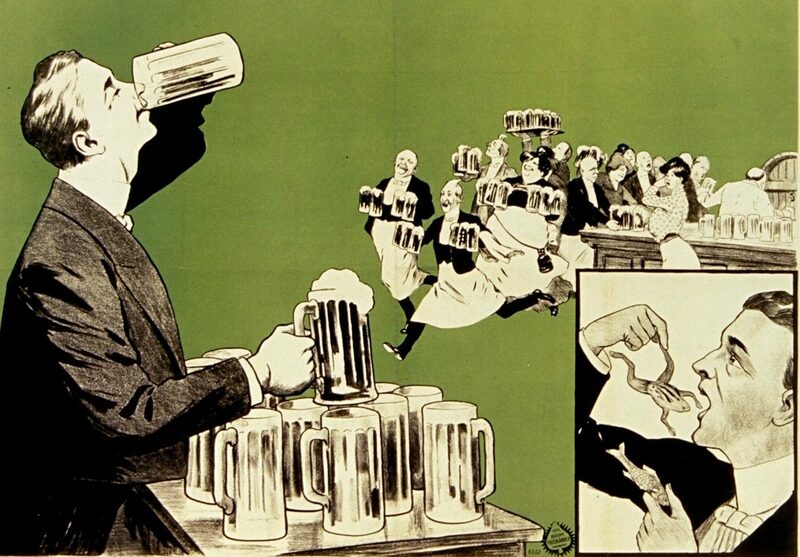 When he had finished these he would return for others and, while gathering another handful, would bring up the beer and eject it into a receptacle arranged between the shelves, just below the line of vision of the audience…”. So at least some of it was a trick. ‘l’Amour Magicien’ (Mister Magician) by Charles O’Flynn; James Cavanaugh & Frank Weldon, French lyrics by Jan Marotte & Jean Cis. Published by Salabert (Paris, 1934) and illustrated by Ch. Roussel. ‘La Grenouille au Nénuphar’ by Clapson & Teredral, published by Clapson (Paris, 1919) and illustrated by Lt. Fetaz. Mac Norton himself believed that he had an extra stomach like a cow. But more likely he suffered from rumination syndrome. This is the effortless regurgitation of undigested food from the stomach back up into the mouth. There is no retching, pain or other inconveniences as in the case of vomiting. Thanks to the treasure trove that is Gallica, I found out that Mac Norton became the subject of medical examinations in 1912. With radiography a doctor revealed the structure of the performer’s stomach. One would expect that he would have taken images of Mac Norton’s insides after swallowing the frogs. But no, he just made him drink some fluid and concluded that his stomach was ‘very muscular‘ and that was about it. How absolutely deceiving! To illustrate once more that songs were made about anything, we insert a Dutch sheet music cover of a song about Röntgen’s discovery: X-stralen (X-rays). On the cover we see the first ever photograph of a human body part using X-rays. It is the hand of Röntgen’s wife on a photographic plate. 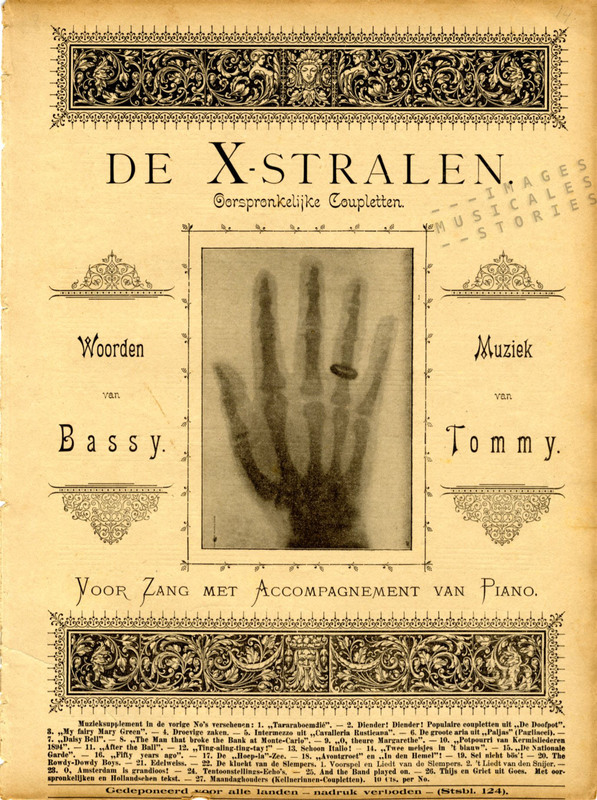 ‘De X-stralen’ (The X-Rays) by Tommy & Bassy, published in 1896. Mac Norton’s international career took him all over Europe and in various parts of South America. The protest actions of the American Society for the Prevention of Animal Cruelty made North America a no go for the frog eater. Claude Delair (1876-1953) continued his Mac Norton tricks until he was well into his seventies. Claude Delair, aka Mac Norton, in the Forties. I found a similar regurgitation act from 1931 by Hadji Ali in a Spanish-language version of Laurel and Hardy’s Chickens Come Home. Enjoy and have a drink! Further reading on magicians and illusionists: ‘Miracle-Mongers and their Methods’ by Harry Houdini. ‘Ah! 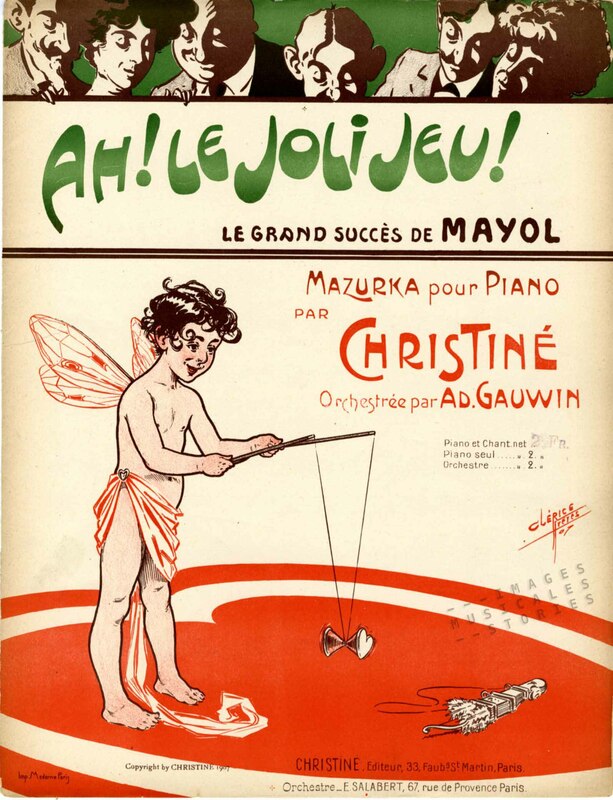 Le joli jeu!’ by Christiné, published by P. H. Christiné (Paris, 1907) and illustrated by Clérice Frères. ‘Ah! Le joli jeu!’ illustrated by Clérice is one of several sheet music about the diabolo. Curiously, apart from one, all are dated 1907. We learned that in that year Gustave Phillipart started the diabolo craze. He was a Belgian civil engineer who lived in Paris. During seven years he had researched how to perfect the old toy. After building about 150 prototypes he finally patented the toy in 1906 giving the diabolo its present-day look. Through an astute marketing campaign the game came into vogue in Paris, shortly to appear all over France the next year. Left: ‘La Diabolette’ by Charles Borel-Clerc published by E. Joullot (Paris, 1907) and illustrated by Pousthomis. 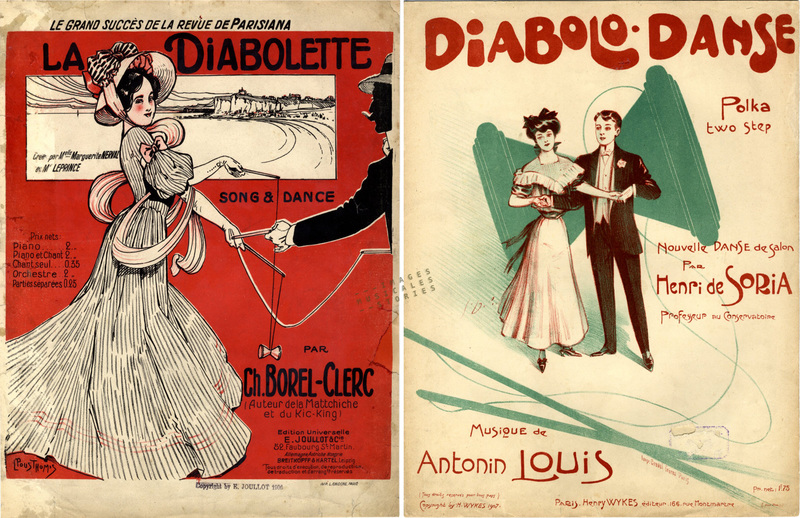 Right: ‘Diabolo-Danse’ by Antonin Louis published by Henry Wykes (Paris, 1907) and illustrated by Georges Dola. To draw attention to the diabolo Philippart and a few friends played diabolo in the Bois de Boulogne every morning. They attracted a cloud of elegant walkers. These onlookers, fascinated with the flying spindle, rushed to a shop to buy one. Word got round and soon the diabolo mania was born. Journalists wrote long articles about the new graceful game. Maybe the new divertissement became quickly popular because it attracted both men and women, young and old alike. 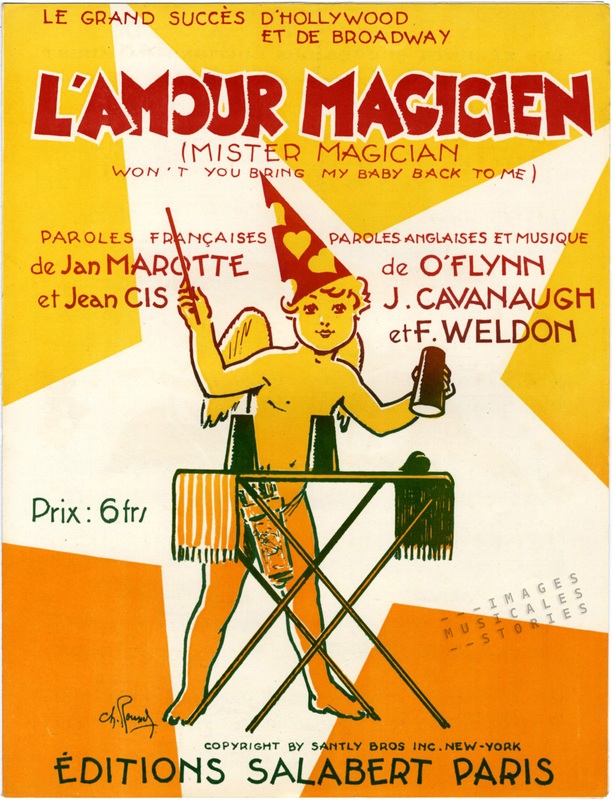 In a French professional magazine, Publicité Moderne, Philippart explains that he also used the many theatres in the capital to promote his diabolo. 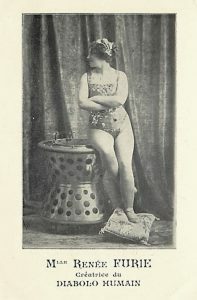 One such theatre even presented a diabolo ballet. Composers and song writers, always on the lookout for a novelty, followed suit in contributing to its success. 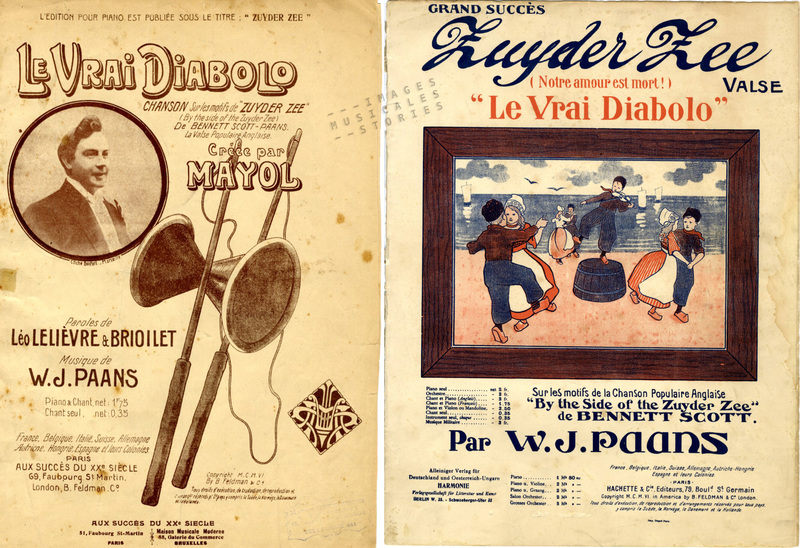 Left: ‘Le Vrai Diabolo’ adapted by Paans and Léo Lelièvre & Briollet published by Aux Succès du XXe siècle (Paris, 1906). Right: ‘Le Vrai Diabolo’ adapted by Paans, published by Hachette (Paris, 1907). The first diabolo song already appeared in 1906 and probably had to be published fast to keep pace with the booming fad. A little British music-hall ditty, By the Side of the Zuyder Zee, was hastily adapted in France as Le Vrai Diabolo. The trifling French text of the song promotes the game with the obligatory harmless sauciness. Jouer le diable au lit! The gist of the verses above is that diabolo is an enjoyable little game that is all the rage, and that if a girl misses her throw of the spinning top, it is because she’s already dreaming of diabolical bed games with her husband-to-be. 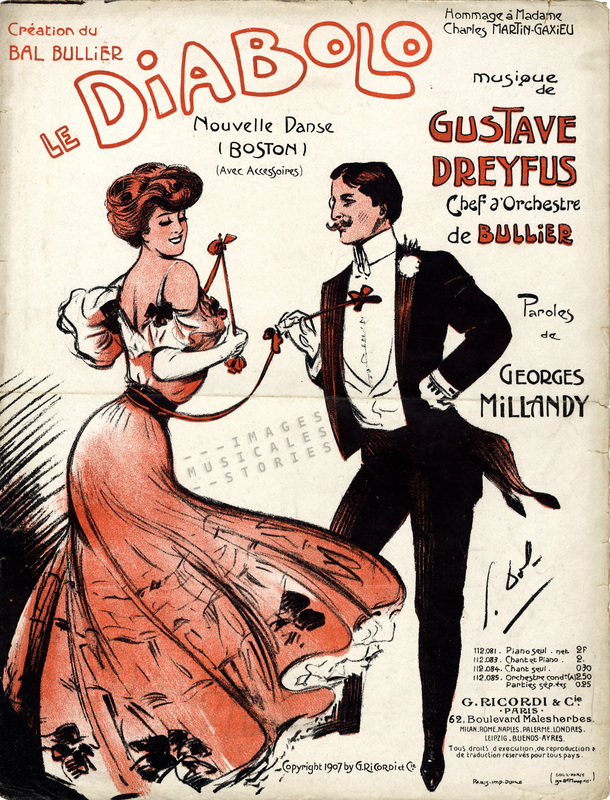 ‘Le Diabolo’ Gustave Dreyfus & Georges Millandy. Published by Ricordi (Paris, 1907) and illustrated by Georges Dola. 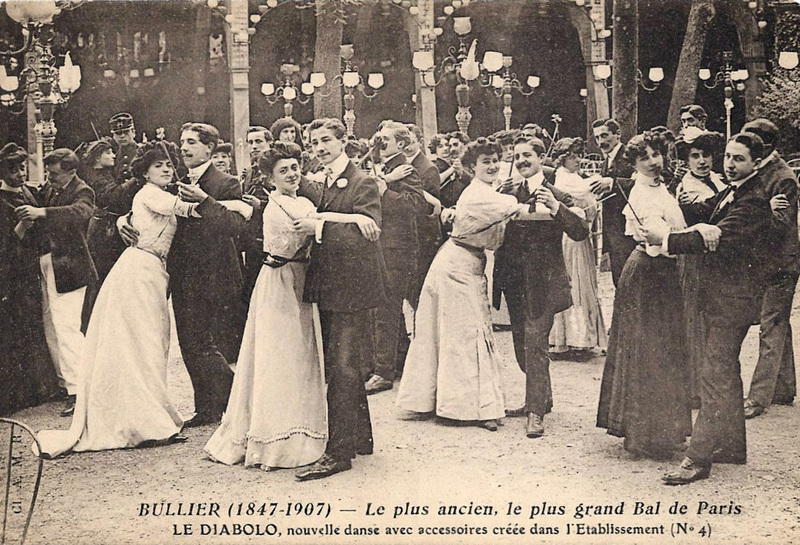 Gustave Dreyfus, the conductor of the Parisian dance hall Bal Bullier, composed ‘Le Diabolo’ a new dance with accessories: two sticks connected by a ribbon, thus providing an elegant instrument to diabolically! entangle one’s dance partner as seen on this postcard. 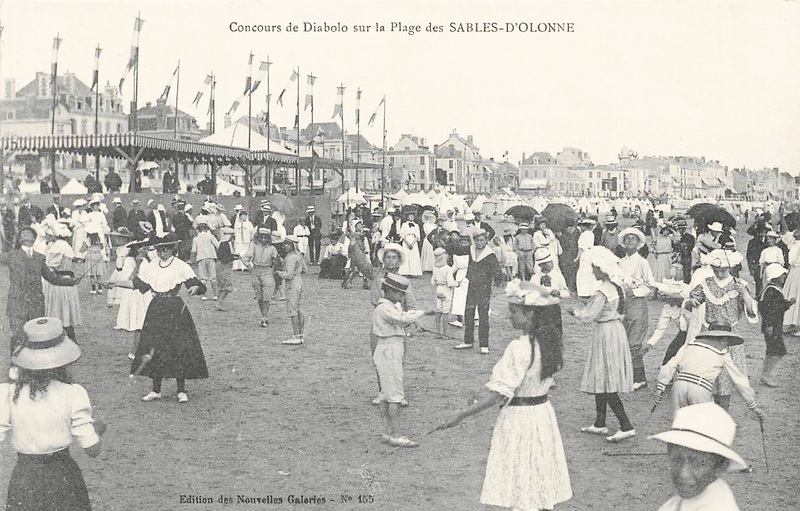 Diabolo tournaments and parties were organised everywhere in France. Parks and beaches offered the best venue. Unfortunately Philippart also got bad publicity. A baby in a pram was killed on the Champs Elysées when a top fell on its head. Philippart argued that the spindle had no shock absorber and thus clearly was a counterfeit. Anyway, as a result of the dreadful accident playing of the game was from then on regulated by police ordinance. To launch his product in England Philippart had contacted the publisher and sportsman C. B. Fry. This famous cricketer created a new sport around the diabolo skills. It could be played like tennis but without a net: it was replaced by a rectangular court. 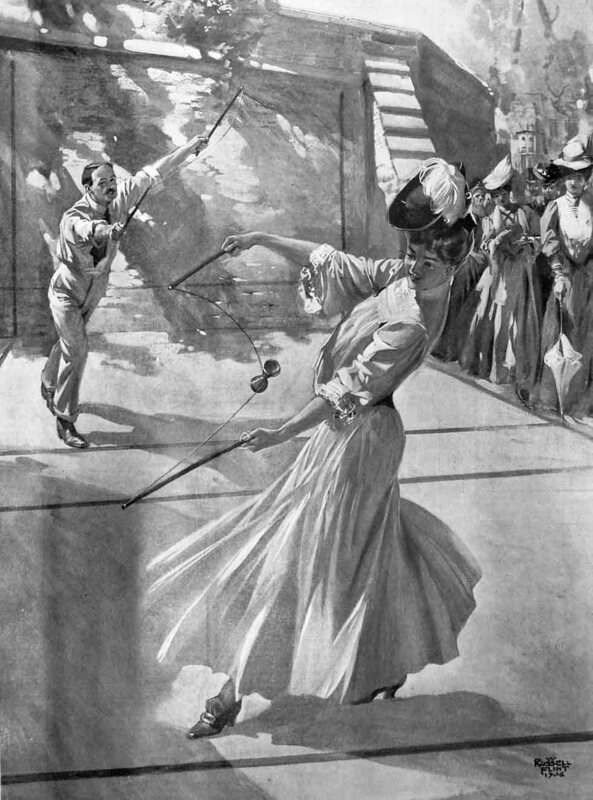 The diabolo is slung from the service court and the player receiving the diabolo allows it to bounce once, then catches it on the cord and returns it… if possible. This playful tennis version did not catch on though. ‘The devil on two sticks’ published by The Illustrated London News, June 23 June 1906, illustrated by Russell Flint. 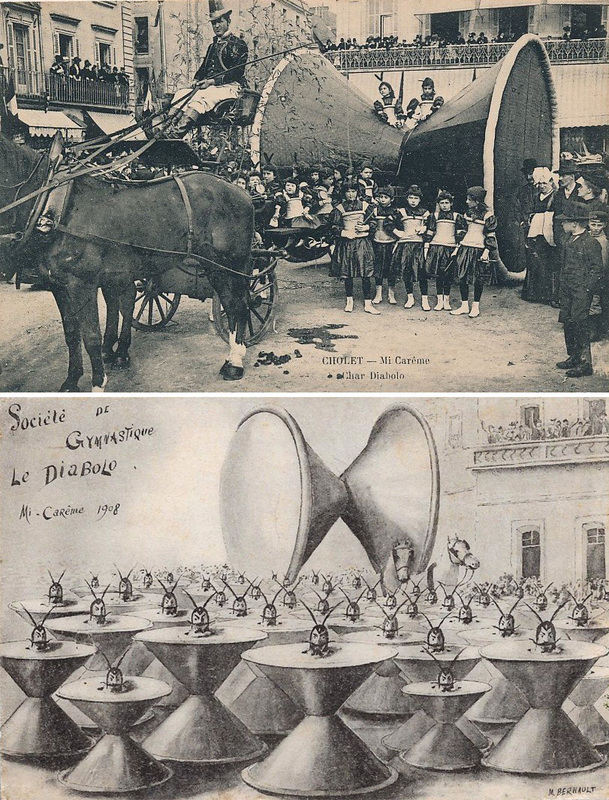 In 1910, miss Renée Furie introduced a new circus act in Paris: the human diabolo. It was a variation on the human cannonball. The daredevil crept into the giant diabolo which was then catapulted into a net. Quel frisson! After which the charming lady elegantly climbed out of the contraption. Ouf! The diabolo craze never lasted that long and only revived moderately during the fifties. Nowadays its popularity has sadly dwindled to that of a traffic light entertainment.